Situated on a working arable farm in a haven of peace and rural beauty with far reaching views across the unspoilt and stunningly beautiful countryside where wildlife is abundant. The spacious light and airy open plan ground floor living area is a very sociable space with a porch leading onto a garden with outdoor furniture and a barbecue – perfect for outdoor dining. This charming cottage for one or two couples or a family makes an ideal base for a memorable holiday at any time of year. 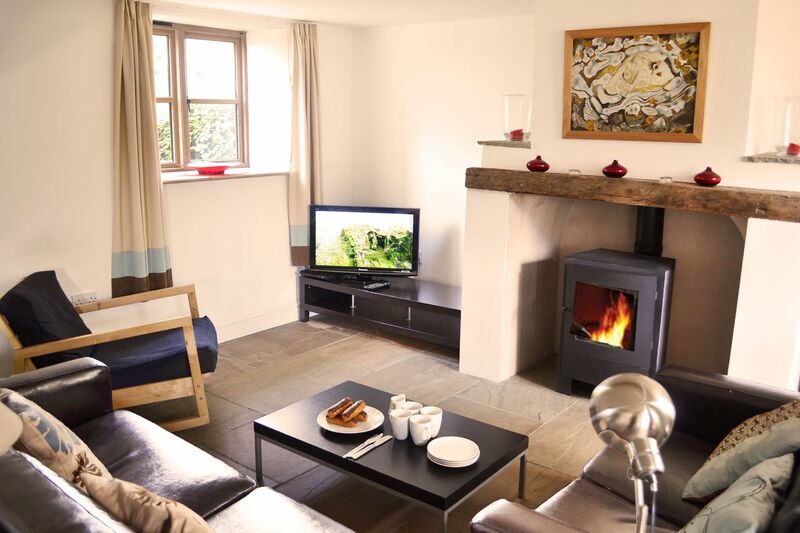 An ideal setting for Autumn and Winter breaks, a New Year gathering or Christmas morning – there is a lot to do in Winter and Guests can return to a warm and cosy barn with central heating, a wood burner, underfloor heating, comfortable beds and relaxing baths. A tranquil, peaceful location, yet just six miles from the market towns of Leominster and Bromyard both with a great range of shops, restaurants, pubs and cafes. The cottage comes with fishing in its own idyllic lake location, exclusive to guests – please bring your own fishing tackle. 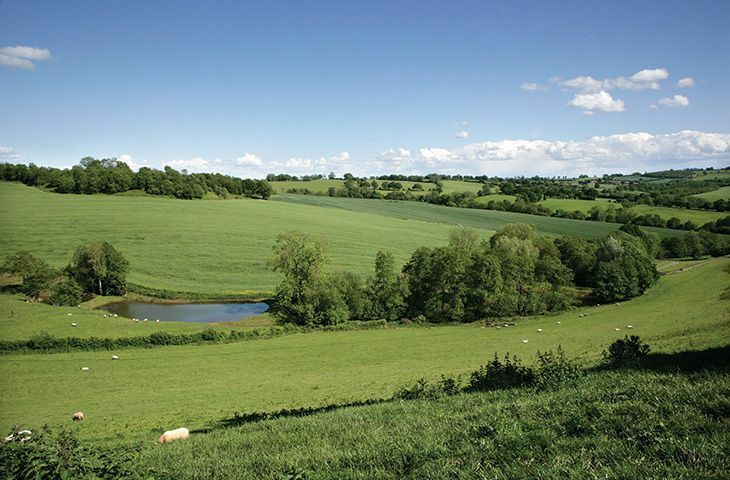 An ideal base for exploring the surrounding countryside with excellent walks from the front door and around the farm. 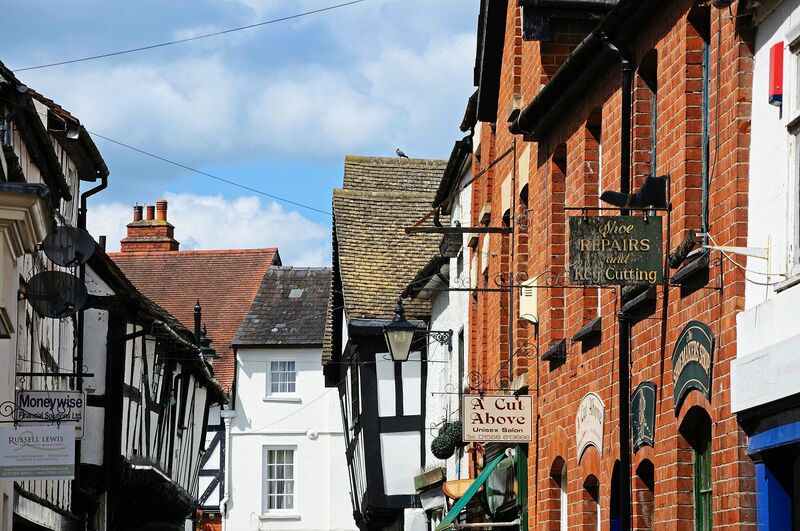 Ideally placed for exploring The Black and White Village Trail, the historic cathedral city of Hereford and the ancient market towns of Ledbury and Ludlow, not to mention the delights of neighbouring Shropshire and Worcestershire. 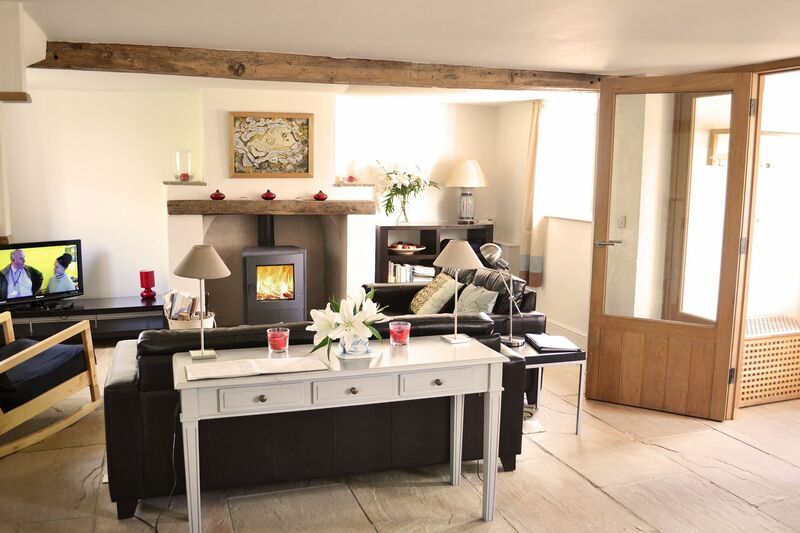 Open plan spacious kitchen, dining and sitting room area with a wood burning stove in an inglenook and exposed beams. The porch leads onto a paved terrace with outdoor furniture and a barbecue and a lovely enclosed garden. 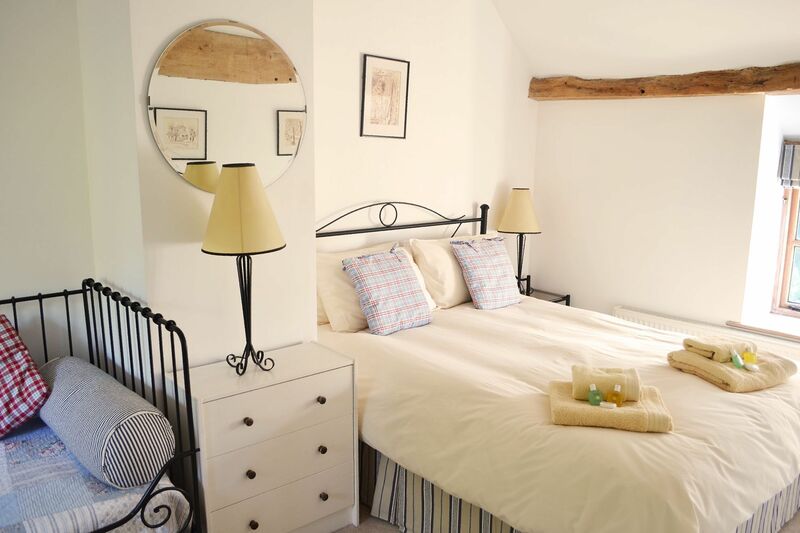 Spacious double bedroom with a 5′ four poster bed, beautiful high pitched ceiling and exposed oak beams. 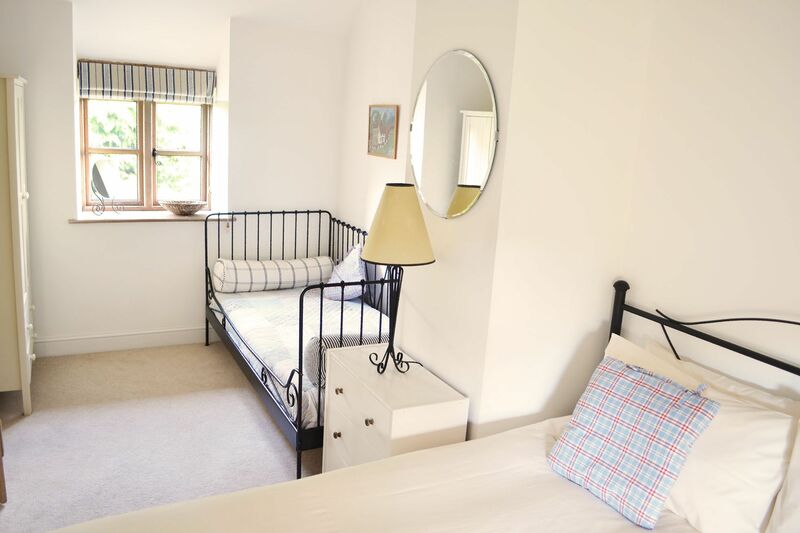 Spacious double bedroom with a 5′ bed, a day bed, beautiful high pitched ceiling and exposed oak beams. Bathroom with a roll top bath and separate shower, beautiful high pitched ceiling and exposed oak beams. 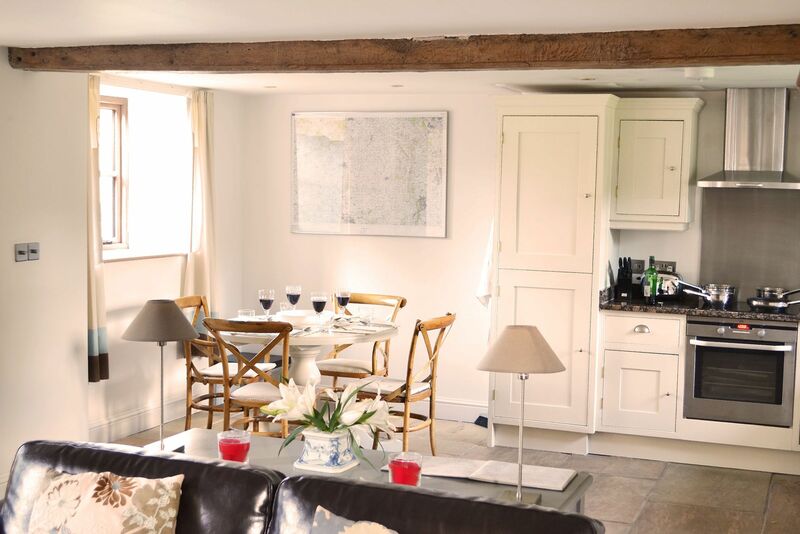 Kick back and relax at Hampton Wafre Cottage. 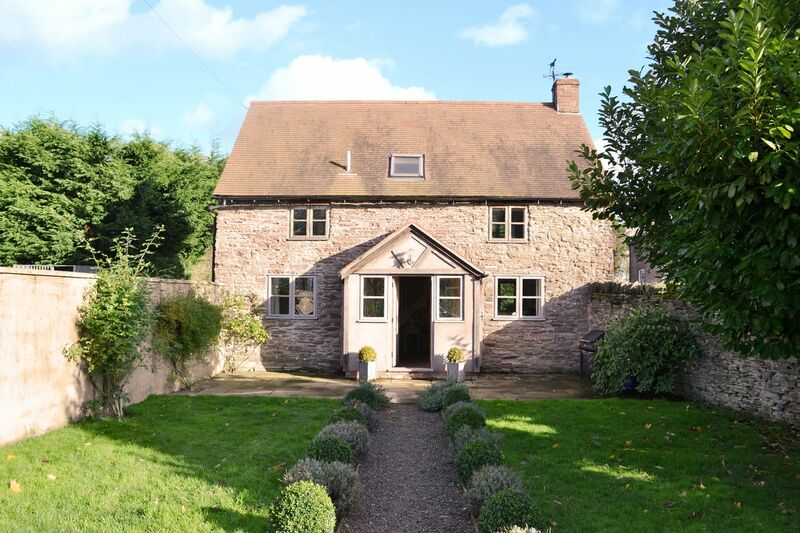 Our beautiful detached 17th century barn renovation is situated on a working arable farm half a mile up a private drive, close to the village of Docklow in Herefordshire. This attractive stone cottage, with original features including exposed beams, makes the perfect getaway for one or two couples, or a family (and their pet pooch)! Short and midweek breaks are available, with a minimum stay of 4 nights. 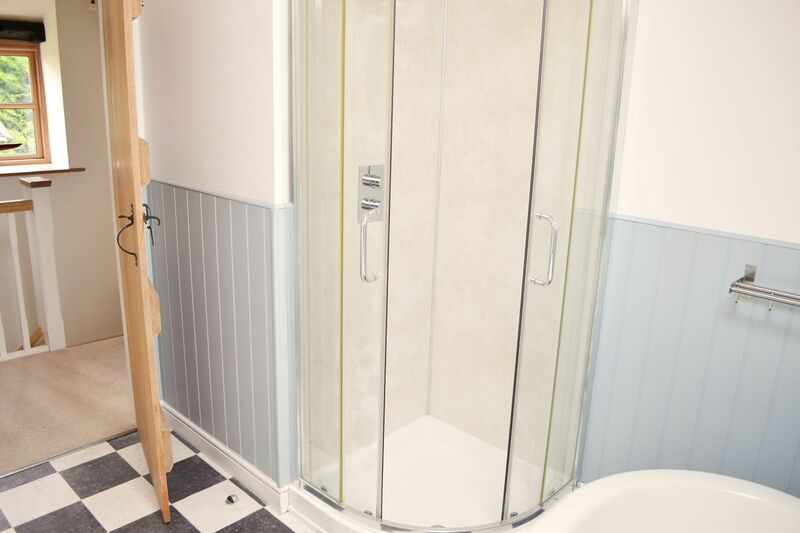 Hampton Wafre Cottage is a real home-from-home, with charming features, elegant furnishings and great attention to detail. It benefits from a spacious light and airy open plan ground floor living space, comprising a spacious kitchen, dining and sitting area with the additional comfort of a wood burner and underfloor heating. 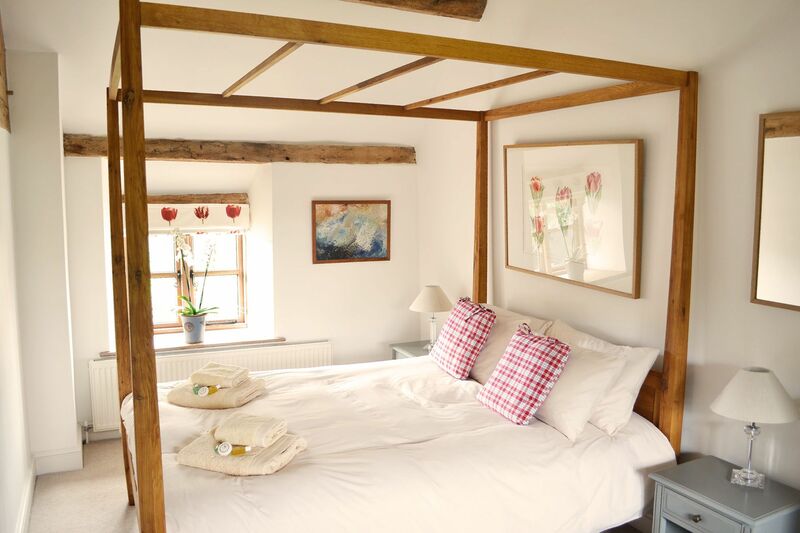 A beautiful vaulted ceiling with exposed oak beams is a great feature of the first floor, which comprises two delightful bedrooms, both with comfortable 5' double beds, and a bathroom with a roll top bath and separate shower. The private enclosed garden has a paved terrace with outdoor furniture and a barbecue overlooking the attractive farm paddocks. A lovely quiet spot to spend some time and to enjoy al fresco dining! With fabulous unspoilt countryside views, indigenous wildlife and comfortable accommodation, the cottage provides an active yet peaceful holiday location. A lovely place to relax in a tranquil setting, explore the beautiful countryside with unrivalled walks straight from the front door. Guests love to roam on the farm and fish for carp in the private onsite lake. The Three Choirs Way and the Three Rivers Ride bridleway run close with cycling trails and horse riding available locally. Docklow Pools, located within the village, also offers excellent fishing, together with a pub and restaurant. Nearby, the town of Bromyard (10 minutes’ drive) has a good range of shops, restaurants and pubs. Leominster (12 minutes’ drive) is a wonderful place to enjoy a lazy afternoon stroll. The town dates back to the 7th century and possesses many fine examples of architecture, along with a wide variety of shops, cafes and pubs. 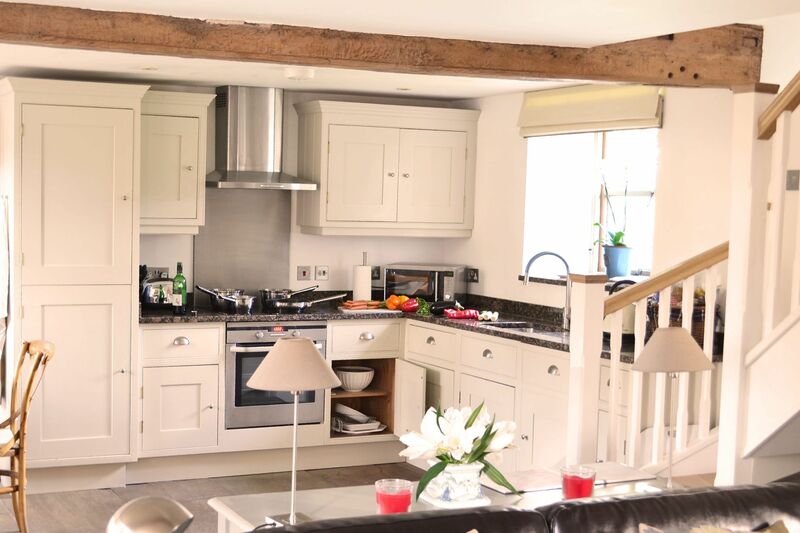 There is easy access to attractions such as stately homes, parks and gardens as well as the historic cathedral town of Hereford and the ancient market towns of Ledbury and Ludlow, the latter of nationwide fame for its many high quality restaurants. Alternatively, explore your ‘spiritual’ side at Chase Distillery or the ‘first cask’ Wye Valley Brewery, both less than 20 minutes’ drive, with tours and tastings easily arranged. 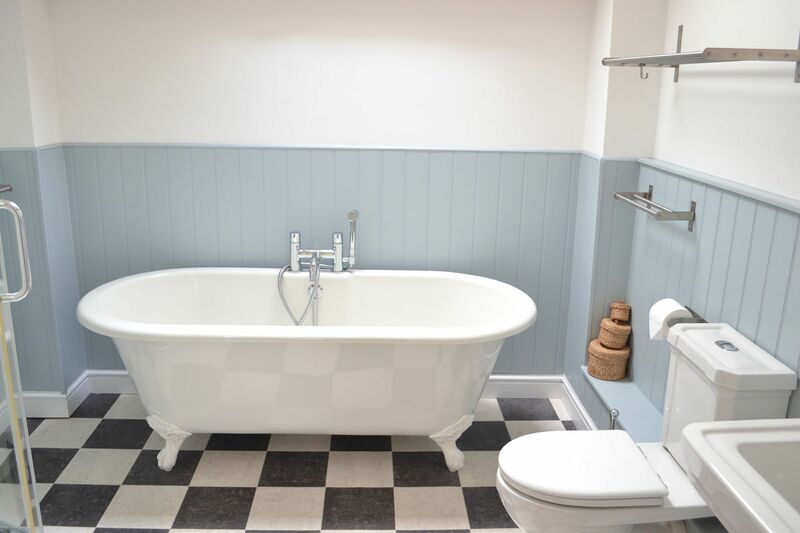 Hampton Wafre Cottage is also ideally placed for exploring The Black and White Village Trail, not to mention the delights of neighbouring Shropshire and Worcestershire. 2019-04-15 A Stripe, Yorkshire "This a perfect getaway. The house is spacious and warm, and there is a front garden that catches the sun each afternoon. It's quite and secluded, and there are plenty of places to walk the dog. We loved this place and will most certainly return. Thank you so much for our stay. The house was beautiful and it was a real pleasure to walk in the grounds of the estate." 2016-05-01 Claire S ”We had a lovely time at Hampton Wafre thanks. The setting was idyllic, the cottage was gorgeous and very well equipped and the owners were lovely. The stay was very relaxing indeed and Star the dog loved it! We were thinking of doing another one in October maybe, if we can persuade ourselves not to go abroad to escape this dreadful weather!! Thanks for all your help, the booking process was very easy, the directions were super and you answered all our questions promptly and comprehensively and we had a lovely time as a result! Since so much of Herefordshire is agricultural, it’s no surprise that the local produce is simply amazing. 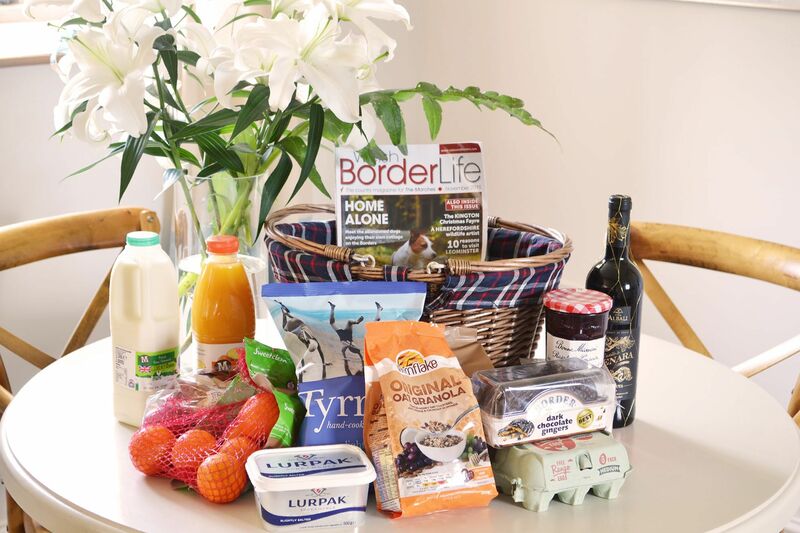 Visit a local farmers’ market for the ingredients to prepare a truly mouth-watering meal back at the cottage, or try out one of the numerous dog friendly eateries nearby where you and your pooch will receive a warm welcome! The Fisherman’s Arms pub and restaurant at Docklow Pools, Docklow (1.7 miles, 4 minutes’ drive). The dog-friendly Stockton Cross Inn in Kimbolton (6 miles, 11 minutes’ drive). Wheelwrights Arms in Pencombe (6.5 miles, 14 minutes’ drive). England’s Gate in Bodenham (7.8 miles, 16 minutes’ drive). Pensons of Netherwood Estate (8.5 miles, 15 minutes' drive). Green Cow Kitchens, Crumplebury Farm, Whitbourne (10 miles, 18 minutes' drive). The Wellington is an award winning GastroPub in Wellington (12.1 miles, 17 minutes’ drive). The CIder Barn at Dunkertons Cider Mill. (13.5 miles, 24 minutes' drive). There a wide variety of restaurants, cafes and pubs in Bromyard (5.8 miles, 10 minutes’ drive) and Leominster (6 miles, 11 minutes’ drive), many of which are dog-friendly. Bromyard (6 miles, 10 minutes’ drive) and Leominster (6.4 miles, 12 minutes’ drive) both have a wide variety of shops. Monkland Cheese Dairy, The Pleck, Monkland (9.5 miles). The Hop Pocket Shopping Village, Bishop’s Frome (10.5 miles). Ludlow Food Centre, Bromfield, Ludlow (18.5 miles). BROMYARD (5.8 miles) has an air of timelessness, with many half-timbered buildings creating a lovely setting for visitors to explore its good range of shops, restaurants and pubs. LEOMINSTER (6.4 miles) is a wonderful place to enjoy a lazy afternoon stroll, the town dates back to the 7th century and possesses many fine examples of architecture, such as the Priory Church, along with a wide variety of shops, cafes and pubs. TENBURY WELLS (9 miles) is a charming, ancient market town situated on the banks of the River Teme. Said to have been called ‘my little town in the orchard’ by Queen Victoria, Tenbury Wells boasts a unique 18th century bridge built by Thomas Telford, the magnificent Pump Rooms and many other listed buildings dating back to the 17th century. This bustling town has many individual shops, traditional pubs, cafes and tea rooms and plays host to many festivals throughout the year notably the Tenbury Applefest in October and Holly and Mistletoe around Christmas. PEMBRIDGE (14 miles) is a medieval village on the Black & White Village Trail boasting many striking 15th and 16th century half-timbered buildings, and has held markets and fairs in the village since the early 1200s. The village has a beautiful 14th century market hall. Westonbury Mill Water Gardens (15.8 miles) is situated just outside the village. LUDLOW (15.5 miles). 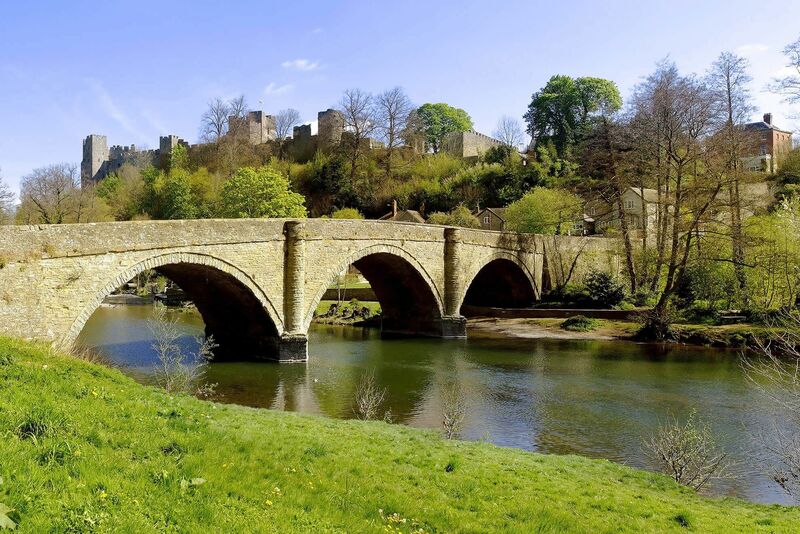 Attractions include Ludlow Castle and hosts several annual festivals (please see the events section at the end of this page). HEREFORD (16 miles). The cathedral town of Hereford dates back to Saxon times and, with its medieval bridge over the winding River Wye, is the very image of picturesque England with a mix of buildings from almost every British era. 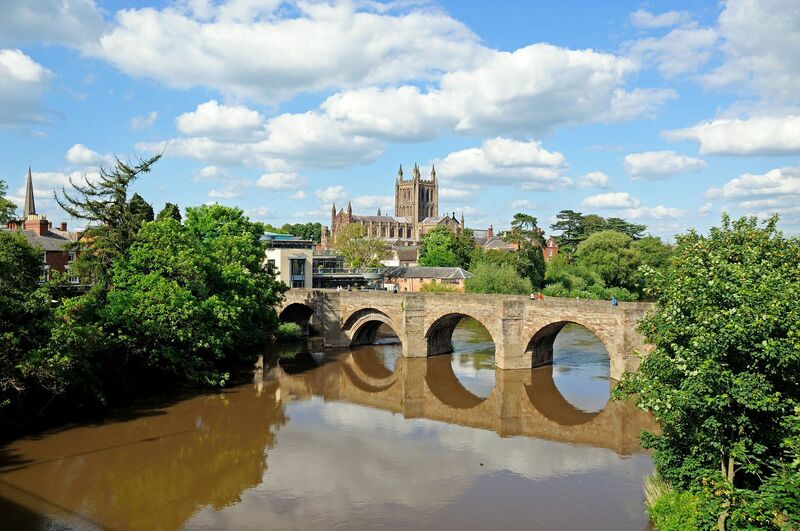 Attractions include Hereford Cathedral, home of the 13th century Mappa Mundi world map and Chained Library, The Cider Museum and King Offa Distillery, The Old House, Hereford Museum and Art Gallery and The Waterworks Museum. GREAT MALVERN (18 miles) is a beautiful Worcestershire town dating back to the Bronze Age and is situated on the eastern side of the dramatic Malvern Hills AONB. The town holds markets as well as The Great Malvern Food Festival in June. Malvern has many individual shops, cafes, art galleries and restaurants and a luxurious spa. LEDBURY (18 miles). Attractions include the Heritage Centre, Butcher’s Row House Museum and Church Street. Eastnor Castle is nearby. KINGTON (20 miles). Celebrated by visitors for its lovely scenery and excellent walking and cycling in the surrounding rolling hills, this quiet, pleasant town offers a number of excellent shops, pubs and restaurants. WORCESTER (20.5 miles). Attractions include Worcester Cathedral, Worcester Porcelain Museum, Greyfriars House and Garden (National Trust), The Commandery and The Elgar Birthplace Museum. MUCH MARCLE (21.5 miles) is a beautiful village in rural Herefordshire. Attractions include Westons Cider Farm which offers guided tours around the mill, a play park for children, tea room and restaurant and Hellens Manor House & Gardens. CRAVEN ARMS (24 miles). Visit the Shropshire Hills Discovery Centre, Stokesay Castle (English Heritage), explore Onny Meadows and the Land of Lost Content (The National Museum of Popular British Culture). HAY-ON-WYE (28.5 miles) is famous for one thing – books! The town has almost 40 bookshops over spilling with thousands of titles and holds an annual Hay Festival of Literature held each May/June. it is also an excellent base for serious walking and other attractions include Hay Bluff and Hay Castle. There are lots of beautiful walks to explore, including excellent walks from the front door and around the farm. There are lovely walks around the Bromyard Downs (Bromyard is 10 minutes’ drive). Bircher Common (11.5 miles) and the neighbouring Croft Castle, including the ancient Croft Ambrey hill fort, from where it is claimed you can see 14 counties, make up a fairly extensive sweep of heathland, woodland and pasture, as well as a series of ancient fishponds. The Three Choirs Way provides a long distance footpath between Gloucester, Hereford and Worcester, with a theme linking the walk and the Music Festival celebrated at the three Cathedrals for over 300 years. The Malvern Hills and commons are very popular with walkers (approximately 19 miles away). Onny Meadows near Craven Arms, behind Shropshire Hills Discovery Centre (23 miles). Carding Mill Valley and the Shropshire Hills (32 miles) – The Long Mynd Walk is a 5 mile walk. Leominster Golf Club, Leominster (4 miles). The Grove Golf & Bowl, Leominster (5 miles). Brockington Golf Club, Brockington Hall, Bodenham (8 miles). The Herefordshire Golf Club, Wormsley, Hereford (17 miles). Kington Golf Club, Kington (21 miles, 38 minutes’ drive) is England’s highest golf course. Hampton Wafre Cottage comes with fishing in its own idyllic location – please bring your own fishing tackle. Docklow Pools, Docklow (1.7 miles) offer excellent fishing, together with their own pub and restaurant. Broadfield Court Vineyard and Gardens, Broadfield Court Vineyard Estate, Bodenham (6.5 miles). Brockhampton Estate (National Trust), Bromyard (7.5 miles). Berrington Hall (National Trust), near Leominster (7.5 miles). Hampton Court Castle, Gardens & Parkland, Hampton Court Estate, Hope under Dinmore (9 miles). Croft Castle & Parkland (National Trust), Yarpole (11.5 miles). Westonbury Mill Water Gardens (15.8 miles) is situated just outside Pembridge. Ludlow Castle, Ludlow (15.2 miles). Eastnor Castle & grounds, Ledbury (19.5 miles). Greyfriars House and Garden (National Trust), Worcester (20.5 miles). Hellens Manor House & Gardens, Much Marcle (21 miles). Hergest Croft Gardens, Ridgebourne Road, Kington (22 miles). Brobury House & Gardens, Brobury (22 miles). Stokesay Castle (English Heritage), near Craven Arms (23 miles). Hay Castle, Hay-on-Wye (28.5 miles). The Cider Museum and King Offa Distillery, Hereford (16 miles). The Old House, Hereford (16 miles). Hereford Museum and Art Gallery, Hereford (16 miles). The Waterworks Museum, Hereford (16 miles). Butcher’s Row House Museum, Ledbury (18 miles). The Ledbury Heritage Centre, Ledbury (18 miles). Worcester Porcelain Museum, Worcester (20.5 miles). The Commandery, Worcester (20.5 miles). The Elgar Birthplace Museum, Worcester (20.5 miles). Shropshire Hills Discovery Centre, Craven Arms (23 miles). The Land of Lost Content (The National Museum of Popular British Culture), Craven Arms (24 miles). Acton Scott Historic Working Farm, Wenlock Lodge, Church Stretton (29 miles). Acton Scott has a superb array of events throughout the year – please check their web site before you visit. Ironbridge Gorge Museums (approximately 40 miles/an hour’s drive), are a series of ten amazing museums located in the spectacular and beautiful Ironbridge gorge. The Black & White Village Trail is a 40 mile circular motor route from Leominster (6.4 miles) through a rich landscape of orchards, hopyards and distant hills, taking in the most picturesque black and white villages along the way as well as the little market town of Kington. Wye Valley Brewery, Stoke Lacy, Bromyard (9 miles) for tours and tastings. Chase Distillery, Rosemaund Farm, Hereford (11 miles) for tours and tastings. Burford House Garden Store, Tenbury Wells (10.5 miles). Small Breeds Farm Park & Owl Centre, Kington (21.5 miles). Heart of Wales Railway Line which runs from Craven Arms (24 miles) to Llanelli in South Wales. Three Choirs Vineyard, Newent (24.3 miles). West Midland Safari Park, Spring Grove, Bewdley (26 miles). Easter Egg Hunt, Brockhampton Estate (National Trust), Bromyard (7.5 miles). Boots and bonnets trail, Berrington Hall (National Trust), near Leominster (7.5 miles). Cadbury Easter Egg Hunt, Berrington Hall (National Trust), near Leominster (7.5 miles). Cadbury Easter Egg Hunt, Croft Castle & Parkland (National Trust), Yarpole (11.5 miles). Children’s Easter Trail and Craft Workshop, Hampton Court Castle, Gardens & Parkland, Hampton Court Estate, Hope under Dinmore (9 miles). Easter Treasure Hunt, Eastnor Castle, Ledbury (19.5 miles). Edwardian holiday trail, Croft Castle & Parkland (National Trust), Yarpole (11.5 miles). Wye Valley River Festival. The Wye Valley River Festival begins in Hereford (16 miles). Chilli Festival, Eastnor Castle, Ledbury (19.5 miles). Wye Valley River Festival. Part of the Hereford River Carnival – Hereford (16 miles). Hellens Music Festival, Hellens Manor House, Much Marcle (21 miles). RHS Malvern Spring Festival, Royal Three Counties Show, Three Counties Showground, Malvern (20.7 miles). Ludlow Food Spring Festival, Ludlow (15.6 miles). Classic Vehicle Day at Eaton Manor, Eaton Manor Country Estate, Church Stretton (27.3 miles). Hay Festival, Hay-on-Wye (28.5 miles). Half term trail at Brockhampton Estate (National Trust), Bromyard (7.5 miles). Half term trail at Croft Castle & Parkland (National Trust), Yarpole (11.5 miles). Medieval Village & Birds of Prey Flying Spectacular, Hampton Court Castle, Gardens & Parkland, Hampton Court Estate, Hope under Dinmore (9 miles). 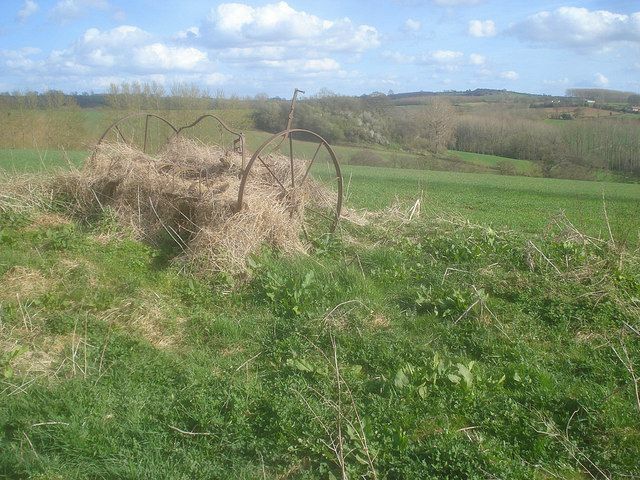 Vintage Eastnor, Eastnor Castle, Ledbury (19.5 miles). Half term trail at Berrington Hall (National Trust), near Leominster (7.5 miles). Great Malvern Food Festival, Great Malvern (18 miles). Half term picnic trail at Croft Castle & Parkland (National Trust), Yarpole (11.5 miles). Hellens Garden Festival, Hellens Manor House, Much Marcle (21 miles). Kington Festival, Kington (20.3 miles). Ludlow Fringe Festival, Ludlow (15.6 miles). Royal Three Counties Show, Three Counties Showground, Malvern (20.7 miles). Bromyard Gala, Bromyard (5.8 miles). Ledbury Poetry Festival, Ledbury (18 miles). Ledbury Food Festival, Ledbury (18 miles). Summer trail at Croft Castle & Parkland (National Trust), Yarpole (11.5 miles). Three Choirs Festival, Worcester (20.5 miles). The Tenbury Countryside Show, Tenbury Wells (9 miles). Children’s Trail, Hampton Court Castle, Gardens & Parkland, Hampton Court Estate, Hope under Dinmore (9 miles). Dinosaur Show, Eastnor Castle, Ledbury (19.5 miles). Boating on the lake, Berrington Hall (National Trust), near Leominster (7.5 miles). Selected dates. Lakefest, Eastnor Castle, Ledbury (19.5 miles). Worcester Festival, Worcester (20.5 miles). Presteigne Festival of Music and Art , Presteigne (20 miles). Ledbury Carnival, Ledbury (18 miles). Boating on the lake, Berrington Hall (National Trust), near Leominster (7.5 miles). Bromyard Hop Festival, Bromyard (5.8 miles). Ludlow Food Festival, Ludlow (15.6 miles). Bromyard Folk Festival, Bromyard (5.8 miles). Malvern Autumn Show, Royal Three Counties Show, Three Counties Showground, Malvern (20.7 miles). Tenbury Applefest, Tenbury Wells (9 miles). Big Apple Weekend, Westons Cider Mill, Much Marcle (21.5 miles). Ghostly graveyard trail, Berrington Hall (National Trust), near Leominster (7.5 miles). Halloween Spooky Fun, Hampton Court Castle, Gardens & Parkland, Hampton Court Estate, Hope under Dinmore (9 miles). 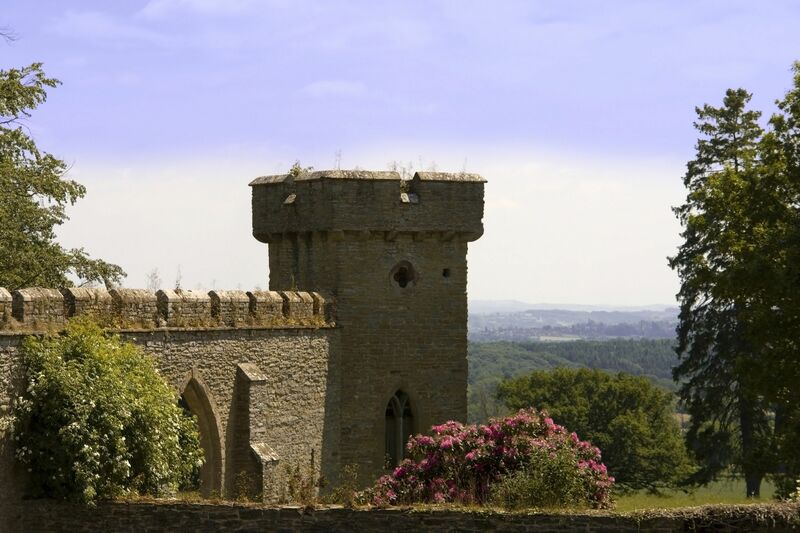 Dungeons and Dragons trail, Croft Castle & Parkland (National Trust), Yarpole (11.5 miles). Hallowe’en spooktacular, Croft Castle & Parkland (National Trust), Yarpole (11.5 miles). Berrington’s annual bonfire and fireworks, Berrington Hall (National Trust), near Leominster (7.5 miles). Fireworks Spectacular, Hampton Court Castle, Gardens & Parkland, Hampton Court Estate, Hope under Dinmore (9 miles). Hereford Contemporary Craft Fair, Hereford (16 miles). Christmas with the Georgians, Berrington Hall (National Trust), near Leominster (7.5 miles). Christmas on the Croft home front, Croft Castle & Parkland (National Trust), Yarpole (11.5 miles). Ludlow Medieval Christmas Fayre, Ludlow Castle grounds (15.2 miles). Holly and Mistletoe, Auctions at Burford House Garden Stores, Burford, Tenbury Wells (10.5 miles). Christmas Fayre at Eaton Manor, Eaton Manor Country Estate, Church Stretton (27.3 miles). Charity Christmas Fair at Broadfield Court, Bodenham (6.6 miles). Hellens Christmas Fair, Hellens Manor House & Gardens, Much Marcle (21 miles). 6.30pm – 9pm. Christmas Bazaar at Westons Cider Mill, Much Marcle (21.5 miles). 11am – 4pm. Kington Festive Food/Drink festival from the Borders, Kington (20 miles). Christmas Trail, Berrington Hall (National Trust), near Leominster (7.5 miles). Christmas at Croft Castle & Parkland (National Trust), Yarpole (11.5 miles).